Colorado Springs Dumpster Rental: We deliver dumpsters in the Colorado Springs metro area, including El Paso County, and Teller County. Our roll off dumpsters can be delivered to Colorado Springs, Air Force Academy, Black Forest, Briargate, Broadmoor, Cascade, Chipita Park, Cimarron Hills, Falcon, Fort Carson, Fountain, Gleneagle, Green Mountain Falls, Ivywild, Larkspur, Manitou Springs, Monument, Palmer Lake, Peterson AFB, Peyton, Pleasant Valley, Rockrimmon, Schriever AFB, Security-Widefield, Stratmoor, Stratmoor Hills, Woodland Park, Woodmoor, CO.
We carry 5 yard, 10 yard, and 15 yard dumpsters. Dumpster rental requests outside of Cubic Hauling’s regular service area are possible, however, they will include a slightly higher price due to the travel distance involved. Pricing will be based upon on your specific location. 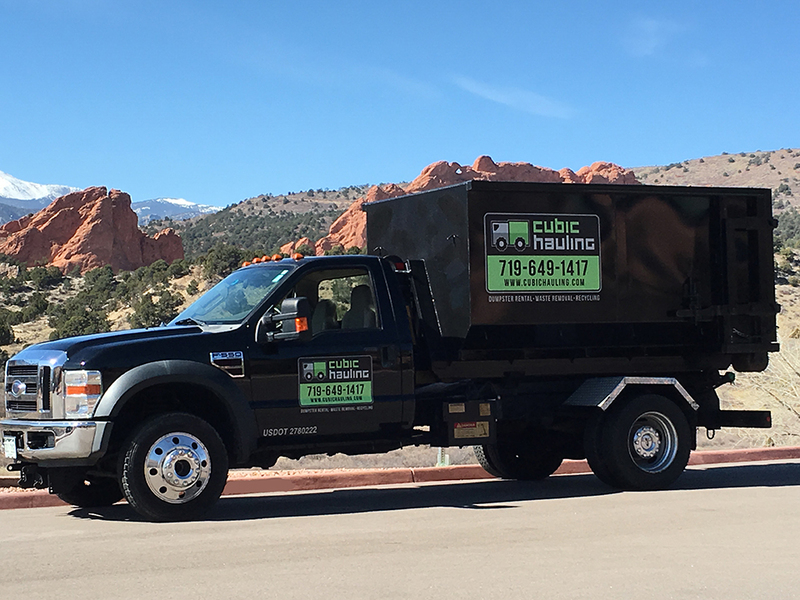 Cubic Hauling offers Colorado Springs Dumpster Rental in El Paso & Teller counties. We serve commercial & residential customers for construction cleanup, junk removal, hauling, recycling, waste removal, and more. Call today at (719) 649-1417 for a free estimate!